With recycling starting to take hold across the nation it is high time to take that environmental benevolence into the workplace and invest it an office recycling scheme. Implementing a recycling scheme in the workplace is not simply a case of doing ones bit to help the environment, it can also help save the company money. At one time commercial recycling may have seemed like an admirable but costly exercise, however with the cost of dumping waste in a landfill increasing year on year, it is fast becoming the economic option. 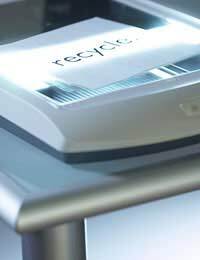 Office recycling programmes have been proven to reduce waste volumes and disposal fees, and also reduce operating costs. Although there will be initial costs involved in setting up a recycling initiative, any expenditure will be recouped in the long term once the financial effects of reducing and recycling waste bear fruit. With landfill tax set to rise by £8 a year, if you do decide to stick to more traditional waste disposal methods, by 2010 you could be forking out a handsome £48 per tonne of rubbish. In addition to its financial and environmental benefits, businesses would also stand to benefit from the positive effect it will have on the company’s public image. If you are planning to implement a recycling scheme then it is vital that everyone in the office not only knows about it but knows the importance of their role within it. To achieve this, you could, for example, help launch your scheme with a recycling day or event. This might include a discussion with staff about the significance of the scheme, its aims and targets along with providing an opportunity to contribute any opinions or recycling ideas they might have. It could also include a desk amnesty where every employee is encouraged to recycle as much as possible from their desk. A recycling scheme is one of the easiest ways to make the office a greener place, and it is also a great way to get employees working together. Rather than throwing yourself into the fire and tackling all waste management aspects at once, it is advisable to begin small and ease your way into a full recycling programme. The most straightforward but significant place to start is with paper. On average office waste bins comprise 70% paper with the remaining 30% made up of plastics, food, metal etc. Paper collection boxes should be positioned in visible areas close to the equipment that use them, such as printers, fax machines and photocopiers, or in places where staff regularly walk past. They should make it as easy to recycle as to throw away. Along with the boxes, clear signs denoting what is and isn’t recyclable should also be provided. Nevertheless it is important to remember that it is still better to save paper by using less and adopting reuse and document sharing practices than it is to throw it in recycle bins. Additional bins could be provided for items such as metal tins and glass bottles. As these items are not as widely used in the workplace a single container for each working area should be sufficient. When collecting used ink jet and toner cartridges, it is advisable to protect them by always placing the old cartridge in the box of the new item. These items cannot be recycled if they are damaged and this practice preserves the ink jet heads and prevents toner powder spillage. Hazardous products like fluorescent tubes should also be protected by being stored in protective containers, ready to be collected. An office recycling station should be provided for unwanted office supplies such as pens, hole-punchers, staples and ring-binders. These can then be sorted and put back in the stationary cupboard for reuse. If your office produces a large amount of recyclable waste then you should consider employing a recycling service to take away your reusable waste. There are now a large number of specialist services available across the country. A good place to start is by using the search tool available on the recycling advice website, WRAP. This enables you find a company that suits your needs by searching under your office postcode, county location and the items you want to recycle. Ask whether your current waste carrier provides a recycling service. Consult your local council recycling office to see whether your business waste is accepted at public recycling centres. Employ a collection service but less frequently by storing your waste.